With final event information still yet to be announced, the initial lineup boasts a heavy balearic influence, with Art Department, Chus + Ceballos, Eats Everything, Maceo Plex, Maetrik Live, The Martinez Brothers, Nicole Moudaber, Paco Osuna, and Technasia slated to perform. 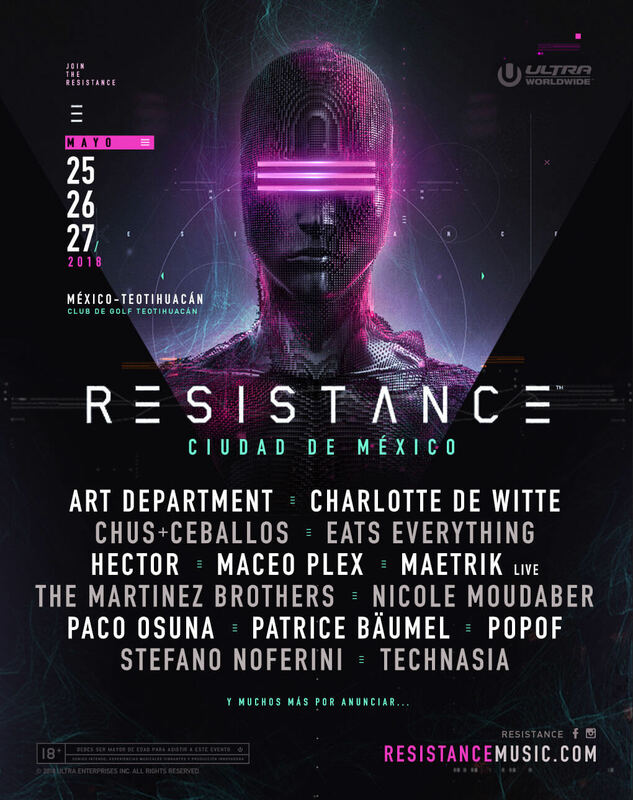 DJ Mag UK September cover star Charlotte De Witte and Afterlife signee Patrice Baumel will play their first ever RESISTANCE event in Mexico City and will be joined by veterans Hector, Popof, and Stefano Noferini. More artists will be announced in the coming weeks. The first stand-alone, three-day RESISTANCE event will take place at the stunning Club De Golf Teotihuacán. A vast archaeological complex northeast of Mexico City, with its remote open air atmosphere and 360-degree panoramic views of the surrounding Teotihuacán region, the striking venue will provide a striking backdrop and breathe energy into the inaugural event. First conceived at ULTRA Buenos Aires in February 2015, the RESISTANCE concept was then rolled out at Ultra Music Festival Miami the very same year. Housed in the awe-inspiring, state-of-the-art ‘Afterburner’ stage, powered by Arcadia Spectacular, RESISTANCE drew huge international attention and has since had custom productions on five continents. 2016 saw RESISTANCE team up with Arcadia in Miami once again, this time for the highly anticipated North American debut of the legendary ‘SPIDER’ structure. In only its second year, the RESISTANCE concept continued to expand at breakneck speed, touching down in ten countries spanning five continents, with events in the USA (Miami), Croatia, South Africa (Cape Town & Johannesburg), Singapore, Indonesia (Bali), Japan (Tokyo), Brazil (Rio De Janeiro) and three standalone events in Paraguay (Asunción), Peru (Lima) and Chile (Santiago). The 2017 and 2018 editions of ULTRA MUSIC FESTIVAL saw RESISTANCE dominate not one, but two huge stages at Bayfront Park, creating a unique festival within the festival. In addition to welcoming back the SPIDER across all three days of the event, RESISTANCE once again hosted the Carl Cox MEGASTRUCTURE for the first two days of the three-day event. 2017 also saw the reveal of the RESISTANCE eight-week Ibiza residency at the world’s largest nightclub, Privilege, every Tuesday from July to the closing party in September. Throughout the summer of 2018, RESISTANCE is slated to takeover Privilege again from July 17 to September 11th, with a full 9 weeks of parties, a week longer than their 2017 Residency. Boasting the most impressive production on the island, the ‘truly immersive experience’ [Deep House Amsterdam] will return this summer with their biggest and most impressive lineup to date. With Shanghai, Seoul, Buenos Aires, Medellín and Mexico City added to the rapidly expanding RESISTANCE global calendar in 2017, 2018 saw the announcement of the first ever stand-alone RESISTANCE festival. Scheduled for May 25, 26, and 27th in Mexico City, the festival will be the first of its kind, and is the first step of many for the RESISTANCE brand in 2018.